Pros - Easy to drive, smaller for portability, great finish, great sound for the price, treble and midrange. EDIT (9/23/2011) : After getting my hands on a couple of "Audiophile Reference" albums, I did more critical listening and added more impressions. (12/9/2011) : Finalizing review after gathering 200+ hours of use. Hi guys, this is my first review, so forgive any mistakes. . This is also my first headphone purchase beyond $60, so my thoughts about this headphone might not be as accurate compared to those with more experience. Setup : iBasso T4 > LOD > iPod classic "7G"
Concise sound impressions : Soft, smooth bass with midrange focus, and laid-back treble. Has the speed to keep up with faster paced music, even unamped. Needs an amp to sound best. Great imaging and instrument separation. Shines with good recordings. It is like a baby K 701 (post burn in). Bass : The bass on these goes deep enough (except for Electronic music), but it doesn't hit very hard. Drums don't have a proper kick, unless you have a proper recording / good source and amp. But what you get is quality bass. It is never intrusive, it is always controlled and tight. Synthetic bass sounds somewhat thin, but EQing (J. River MC's Parametric EQ is very good at this) solves this. Too much EQ'ing makes the bass muddy, though. Midrange : The midrange sounds very natural in tone, but it is slightly forward. Upper midrange is somewhat sibilant unamped (on a somewhat bright source like the iPod), a warm amp such as the iBasso T4 changed this. It is very pleasing to listen to. Female voices sound better than male voices, but they aren't far behind in terms of realism. One of my favorites to listen on these are The Cranberries. Dolores O'Riordan's voice sounds as good as I have remembered listening to my dad's Hi-Fi when I was young. Beethoven's symphonies sound very spacious. Treble : The treble of these extends nicely, but they are slightly laid-back. They are fast, detailed but it is slightly laid-back. I like it for classical (in fact, this is THE sub-$150 headphone for classical, IMO), but it lacks the energy for Rock. It doesn't do micro-detail very well, though. It is forgiving of (not-so) poor recordings. Soundstage : Soundstage isn't really large. It depends on the recording. For example, Beethoven's symphonies sound much more spacious than other songs I have tested them with. But it lacks depth, IMO. It sounds slightly 2D (except when you're listening to proper live recordings / audiophile recordings). Overall : Despite being a studio headphone, it is not analytical like some others. It is musical, forgiving of low-bitrate songs, and don't have much faults for the price (besides the slightly lean bass). Efficient enough to be used with an iPod, but benefits from amping. 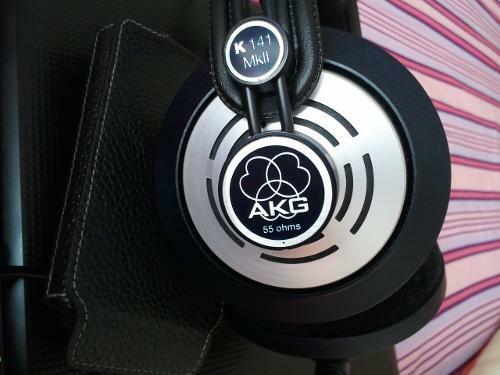 Being at the same price range as the AKG K 240 Mk. II, most people overlook this. But if you're looking for a much more efficient headphone to run unamped at the $100-150 price range (you can find them cheaper online, don't let what I paid mislead you, since I bought them locally from a store that sells recording studio gear.) thats especially great for classical / jazz / vocals, then look no further. also, do the k141s have the same fit as k142? I'm trying out the k142; couple hours later ears = OUCH.